Perhaps you come up a formula that actually proves the Theory of Relativity is completely wrong. Maybe you have written a best selling novel in Word 2007. You definitely want to associate a protective license on it. in our digital age there is an enormous amount of Ideas, creative writings, and music are available at our finger tips. It is very important to protect your work. 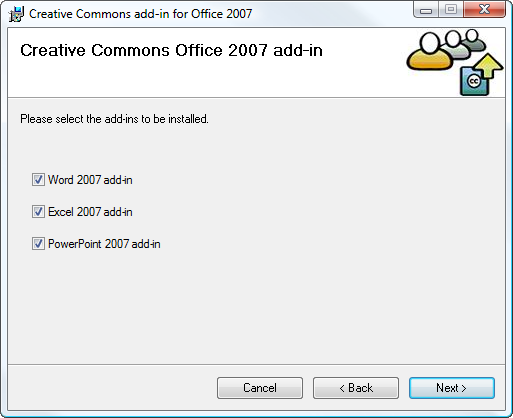 The Creative Commons add-in for Office 2007 makes it easy. 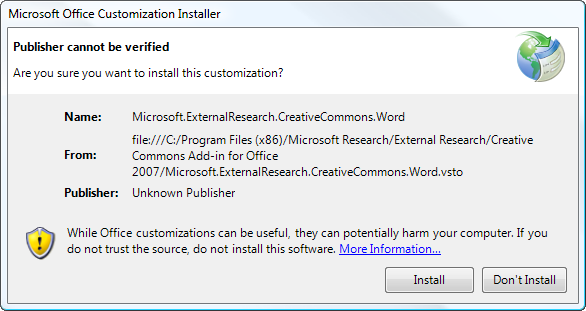 First you will need to download the Creative Commons add-in for Office 2007. Make sure and select the appropriate applications you want to include the add-in. For the sake of not having to install it later just select all three. After you have installed the Add-in restart Word and you will get the following message. Go ahead and click Install. 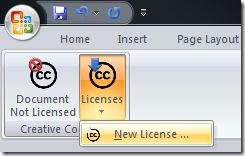 Now you will see a new tab on the Ribbon called Creative Commons. In that tab you will want to click on Licence and New Licence. The icon next to it is just showing the document is not yet licensed. A screen will pop up for you to select the type of CC License you want to associate with the document. 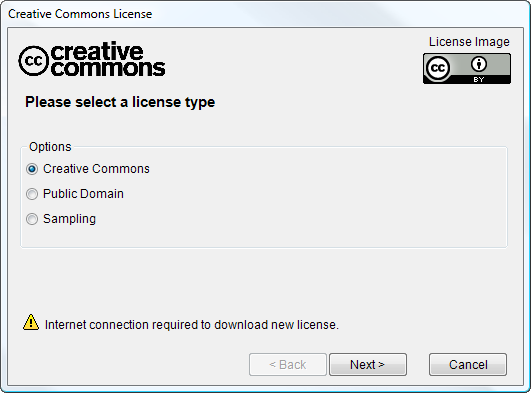 For more information about choosing the right type of License for your work check out CreativeCommons.org. You will also be asked if you want to allow modifications or commercial use of your work. After you have made all the choices about the license you can then decide to keep it as it is or remove it. I am going to select the license I just created through the Wizard. You then get a visual image of the CC icon that you can move to a suitable place within the document. For this instance I put it at the end of the work. The Hyperlink will point to the location of the license over at CreativeCommons.org. If you use the CC to protect a lot of the work you create in Office 2007 this is a great add in to have!